PULLMAN, Wash. – Pacific Northwest farmers have found success growing peonies for a thriving global market. But a devastating fungus called Botrytis is limiting market growth and profits for Northwest farmers. The peony is a symbol of good fortune and happy marriage and has been a beloved centerpiece of floral arrangements and wedding bouquets for hundreds of years. Stippling the peony’s emerald leaves with unsightly blotches of brown and purple, Botrytis can ruin up to half of growers’ crops long before they’re ready to sell. What’s worse, the fungus can strike invisibly, turning a shipped box of seemingly perfect flowers into a brown-streaked mess, leading to upset customers and cancelled payments. 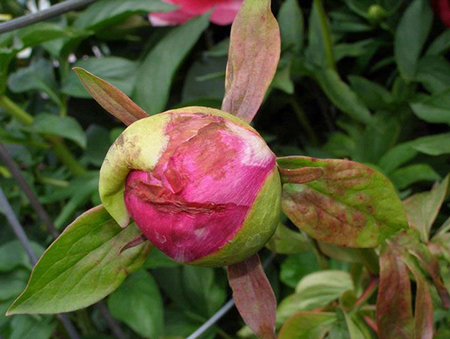 “Diseases caused by Botrytis are the peony’s number one health problem,” said Andrea Garfinkel, a fall 2017 Ph.D. graduate from Washington State University’s Department of Plant Pathology. Garfinkel is helping farmers put a stop to this pervasive pest. Working with growers and scientists in the United States and Europe, she has discovered that there is more to this disease than anyone ever suspected. Surveying 12 U.S. states using modern molecular genetics tools, Garfinkel discovered multiple new species of Botrytis, including one new species that affects grapes and peonies. She also found five other fungal diseases that had never been reported in the United States before. “When you study an old disease but apply new technology to it, you come up with new answers,” says Patricia Holloway, emeritus horticulture professor at the University of Alaska-Fairbanks and member of Garfinkel’s research committee. For more than 15 years, Holloway has worked with Alaska farmers to build a successful export peony industry. But, as Alaskan farmers cleared forests to put in peony fields, Botrytis has plagued them “almost from day one,” Holloway said. Affecting every part of cultivation, from planting to harvest and storage, Botrytis is expensive and labor intensive to control. Holloway turned to WSU Professor Gary Chastagner, an expert on Botrytis in ornamental crops. Garfinkel, one of Chastagner’s doctoral students, accepted the challenge to find out what was happening to peonies in Alaska and other western states. 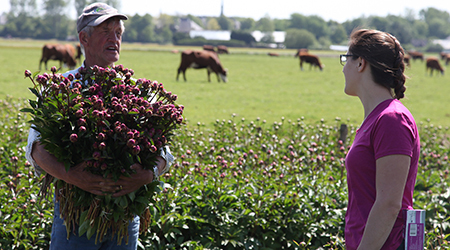 WSU plant pathology Ph.D. graduate Andrea Garfinkel talks with peony grower in Western Washington, during one of her trips to collect samples for inspection. Over the last three years, Garfinkel worked with Holloway and Chastagner to visit growers in Alaska, Washington and Oregon. The researchers sampled diseased specimens at planting time, during the growing season and when plants went dormant. After collecting samples from the blemished foliage and flowers, Garfinkel cultured the fungus, extracted its DNA, then used a process called polymerase chain reaction, or PCR, to find the code for its genes. With that code, Garfinkel could compare it with other samples of fungi to see how they are related. That was how she revealed several new species. The first of her reported discoveries, a new species called Botrytis euroamericana, found jointly with Italian scientists, was detailed earlier this year in the journal Mycologia. Garfinkel also revealed, for the first time in the Northern Hemisphere on peonies, a fungus called Mycocentrospora acerina, found only recently for the first time on peonies in Chile. “Andrea has opened up a lot of eyes,” Holloway said. “She’s added almost one third as many names to our list of known species.